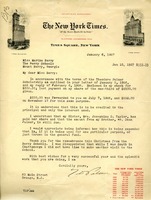 In this letter Martha Berry thanks C.C. 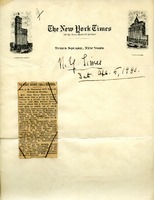 Walace for the Magazine Section of the Sunday New York Times. 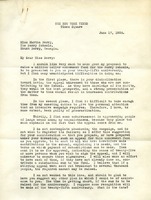 She also implores him to tell his friends about the Berry Schools. 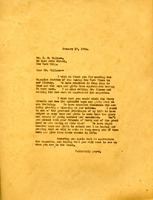 Gillian Keller Lang, secretary to Adolph S. Ochs, publisher of the New York Times, writes Martha Berry to acknowledge the receipt of her letter in Mr. Ochs' absence. Donation of $250 towards the Theodore Palmer Scholarship. 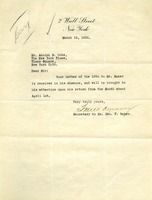 Letter regarding Mr. Baker's absence in office at time of receipt of letter. C.E. 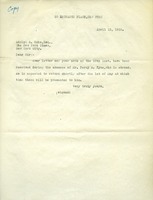 Mitchell responds to Mr. Adolph S. Ochs letter regarding the Berry Schools and states that he will "look into it." 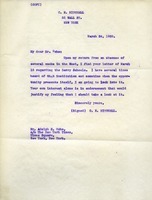 In this letter the office of Mr. Percy R. Pyne tells Adolph Ochs that Mr. Percy R. Pyne is abroad and that his letter will be received when he returns. 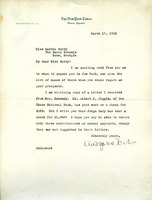 Elizabeth V Clark donates $10.00 in order to rebuild the burned down dormitory.